As if Trump, and this nation, has nothing else going on...now we have natural disaster Obama ready to blow across the land bringing with him all of the DNC hell he normally musters, right on queue. They certainly don't want to see any more of America uniting the way we have over Hurricane Harvey. Time to divide once again, and blame Trump for following the law. You know it’s killing this guy not to be on camera every day scolding Trump in his usual “that’s not who we are” terms but that would be a strategic disaster so obvious that silence is really the only option. 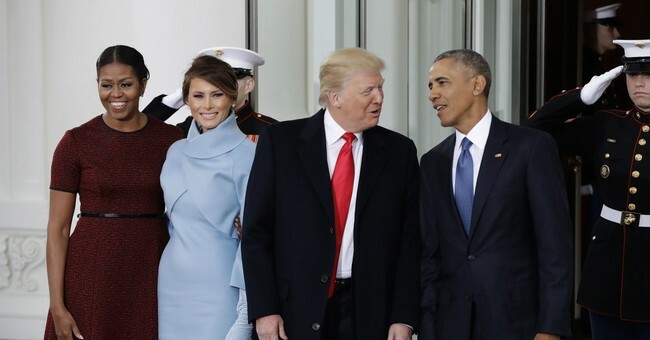 A “Trump vs. Obama” fight over almost any issue would unify most of the right behind the president and O knows it; the most brutal thing he can do to Trump is to deny him that our-guy-versus-their-guy dynamic. I don’t think it’s crazy to believe that Trump’s job approval would be five to 10 points higher if Obama had spent the last seven months sniping at him regularly. By withholding his criticism, he’s made it possible for “soft” Republicans and right-leaning independents to criticize POTUS without fear of being accused that they’re carrying O’s water. But that’s about to change, and possibly for good strategic reasons. Even with Trump set to nuke one of Obama’s signature programs and O convinced that he needs to say something, he so fears becoming a useful partisan foil for Trump that he’ll deny him a video soundbite. The critique will be delivered via social media, not in front of a camera where it would be replayed endlessly on the news to irritate Republicans in a visceral way. Having Obama wade in publicly on the side of DREAMers will complicate all of that. With O banging the drum for amnesty, Republican voters who are lukewarm on the idea in the first place will start to turn frosty. Populists will have a field day attacking Ryan and McConnell (and Trump?) for essentially doing Obama’s bidding by negotiating for a DREAM bill. Some congressional Republicans might start to get cold feet. The more hostile Trump and the congressional GOP become towards a DREAM deal as part of a backlash towards Obama, the more ammo Schumer will have to say that Republicans are being cruel to poor illegal children whose only mistake was trusting the federal government. The whole GOP “we like DREAMers too!” messaging effort will be scrambled. Either negotiations will end up collapsing in Congress, with Dems using the DREAM failure against Republicans next fall, or Trump, Ryan, and McConnell will have to swallow hard and approve an amnesty cheered on by Barack farking Obama, which is about the RINO-iest move a modern Republican is capable of making. Either the GOP base ends up angry at the White House or everyone else does. Obama “speaking out” is tinder for the match Trump is about to strike. Here’s a two-fer for you to illustrate the thorny politics ahead for Republicans. The Obama clip is from his last press conference, two days before the inauguration, when he said that Trump rescinding DACA is one of the things that might get him to re-enter the political fray. The other clip is of Trump nemesis Jeff Flake warning that he’s a yes on a DREAM amnesty but a no on demanding a border wall in return, which means McConnell starts with just 51 votes on the sort of package Trump might accept when he needs 60.